A method of growing III-nitride films on nonpolar planes where the MQW barrier thickness can be manipulated. Current nitride-based electronic and optoelectronic devices, including light-emitting diodes (LEDs), use nitride films that are grown on polar surfaces. These surfaces cause polarization, which in turn separates electrons from holes. This separation limits carrier recombination efficiency, and causes the devices to emit mostly in the red region of the spectrum. This polarization severely limits the flexibility of emission wavelength, and thus the colors, that devices can exhibit. However, polarization can be limited by growing devices on nonpolar planes. By using nonpolar planes, total polarization can be greatly reduced, possibly to zero for certain combinations of alloys on specific planes. There have been successful optoelectronic devices grown on nonpolar planes, but they have had trouble producing longer wavelength emission. The limitation has been due to the barrier thickness of MQWs (multiple quantum wells), which has only allowed for light emission in the violet region of the spectrum. UC Santa Barbara researchers have developed a method of growing III-nitride films on nonpolar planes where the MQW barrier thickness can be manipulated. This results in the ability to vary the wavelength (color) of light emitted by the devices. 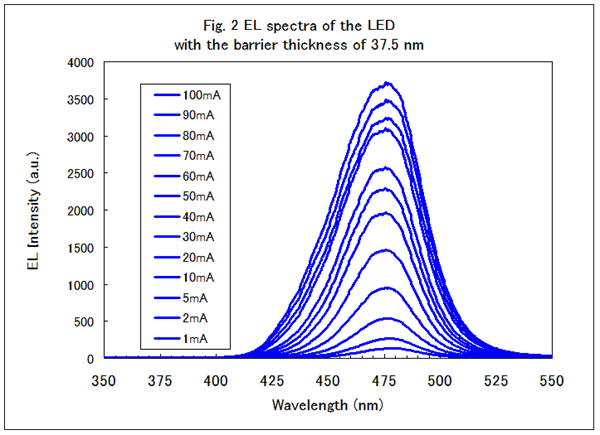 Small barrier thickness results in short wavelength visible light, while increasing the barrier thickness results in subsequently longer wavelength emission. The reduced polarization in these devices, coupled with the ability to change the wavelength of emission, would improve the overall performance of optoelectronic devices.